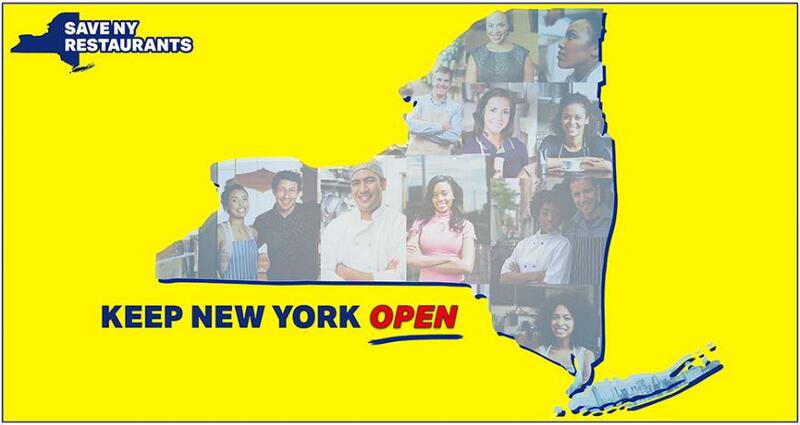 ALBANY, N.Y., June 26, 2015 /PRNewswire-USNewswire/ -- More than 100 restaurant owners and operators representing hundreds of restaurants across the state of New York sent a letter to Governor Cuomo imploring him to keep New York open for business. The letter was written in response to the Governor's decision to unilaterally instate a self-appointed wage board targeting fast food restaurants without any representation from the restaurant industry. In the letter, the group discussed the unfair and arbitrary process of targeting a sole segment of a single industry. "As the owners and operators of New York's restaurants, we write to express critical concern with your decision to unfairly and arbitrarily target our businesses. New York's 20,000 limited-service restaurants are economic drivers; creating jobs and state revenue in every community from Staten Island to Schenectady. Our restaurants provide opportunity to more than 280,000 New Yorkers of all backgrounds and skill levels, a large majority of which are those just entering the workforce. "While the decision to raise the minimum wage for restaurant workers may be well intentioned, circumventing our duly elected representatives and unilaterally appointing a wage board without representation from anyone in our industry is misguided at best and suspicious at worst. We remain voiceless in this process as you have chosen to exclude the very industry you are targeting in your decision-making." The group also addressed the severe implications a dramatic increase will have on continued opportunity for New Yorkers across the state. "We are not the corporations whose names we bear but rather New Yorkers who work hard each and every day. We – the owners and operators of New York's restaurants – are law-abiding, tax-paying residents who run our own businesses…Restaurants operate on razor-thin margins. Labor is among the highest cost, and a dramatic wage increase such as the one you are proposing, cannot simply be passed off in menu price-hikes to the detriment of patrons – and ultimately our industry. "By singling out fast food restaurants while ignoring other industries that hire entry-level workers, you will put our businesses at a competitive disadvantage. In doing so, you will leave behind more than two million New Yorkers making the minimum wage in other industries." The group called on Governor Cuomo to meet with members of the restaurant industry to find other solutions, like increased access to education, skills training and development to help solve New York's wage gap. New research by the Employment Policies Institute of nearly 1,000 New York fast food operators found that nearly 50 percent said they'd be forced to "reduce employees' hours or staffing levels" due to drastic wage increases, while another 22 percent said they would be forced to close their doors altogether. Seventy percent said they likely would have to raise their prices to meet the proposed wage requirements, which would hurt their businesses. To view the letter visit http://bit.ly/1LtZr9V. Visit www.KeepNYOpen.com to learn more. About Save NY Restaurants The "Save NY Restaurants" Coalition represents thousands of businesses across New York State through its memberships. The Coalition's goal is to showcase the arbitrary way in which Governor Cuomo has worked around the state legislature to enact a self-appointed wage board without any representation from the restaurant industry. The actions of the wage board could have a devastating impact on restaurants and businesses across the State. The coalition is asking Governor Cuomo and the members of the wage board to include owners and operators in their decision making process.